There was a moment when the Hail to Reason line through Halo threatened to establish itself as the “third force” in U.S. breeding (behind the inevitable Mr. Prospector and Northern Dancer). Of course we still have the ultra-consistent Southern Halo son More Than Ready (TrueNicks,SRO) (whose own son Ready's Image (TrueNicks,SRO) currently has first yearlings), and some imported Sunday Silence stallions (including Hat Trick (JPN) (TrueNicks,SRO), who is sire of French 2-year-old group I winner Dabirisim with his first crop this year). However, earlier this month we caught a glimpse of what might have been for Halo via Saint Ballado. After Sunday Silence and fellow Kentucky Derby (gr. I) winner Sunny’s Halo (a disappointing stallion), Halo’s most notable son as a performer was champion 2-year-old Devil’s Bag. Unfortunately, although far from a disaster (he sired 46 stakes winners), Devil’s Bag didn’t come up to the highest expectations as a sire. 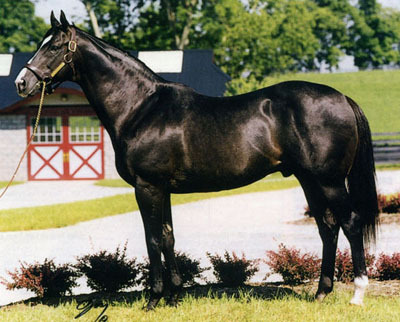 He was a useful minor sire of sires, notably with Devil His Due (TrueNicks,SRO), Taiki Shuttle (a Pedigree Consultants recommended mating who was a champion in Japan, and group I winner in Europe, and has had some success as a sire in Japan), and Diablo (exported to Japan after making a bright start in Florida), but never really appeared likely to extend his line in the U.S. However, help was on its way from an unexpected quarter. Devil’s Bag’s brother, Saint Ballado, was nowhere near as impressive a runner as his Eclipse Award-capturing brother, his most notable triumphs coming in the Arlington Classic (gr. II) and Sheridan Stakes (gr. III). Retired to stand at a modest fee in Florida, Saint Ballado gave us another example of the vagaries of genetic inheritance, as the lesser brother became the superior sire. His bright initial efforts brought Saint Ballado a move to Kentucky where he continued to do well. Unfortunately, in October, 2002, when he was just 13 years old, Saint Ballado was euthanized after failing to recover following surgery to correct clinical signs associated with a compressive cervical myelopathy. A number of sons from Saint Ballado’s early crops retired to stud, but one by one, horses like Captain Bodgit, Yankee Victor, Flame Thrower, Straight Man, and Sweetsouthernsaint, demonstrated that they were unlikely to extend the fortunes of their sire line. While several of Saint Ballado’s first stallion sons, conceived when he was standing inexpensively, had modest backgrounds on the distaff side, this wasn’t true of the horse who might have been the savior of the male line, Saint Liam. Bred by the late Edward P. Evans, Saint Liam, the Horse of the Year in 2005, had a pedigree to match his talent. Out of the stakes-winning Quiet American (TrueNicks,SRO) mare Quiet Dance, Saint Liam was a half brother to three other stakes winners (including Molly Pitcher Stakes (gr. II) victress Quiet Giant), and to the dam of 2011 grade I winner Buster’s Ready. The second dam was a three-parts-sister to Minstrella, a juvenile champion in Europe, and in tail female line the family went all the way back to the great mare Gallorette. Tragically, Saint Liam died as a result of an accident when walking to his paddock, after siring just one crop. The degree of loss can be measured by the fact that the single crop has so far produced 12 stakes performers, six stakes winners, and three graded winners, headed by grade I scorers Havre de Grace. Havre de Grace, who had already earned fame through her battles with champion Blind Luck, carved herself a particular niche in history when defeating colts in the Woodward Stakes (gr. I, video below). Saint Liam also had a talented son in Buddy’s Saint, who was among the winter favorites for last year’s Derby following impressive wins in the Nashua Stakes (gr. II) and Remsen Stakes (gr. II). Unplaced as favorite in the Fountain of Youth Stakes (gr. II), Buddy’s Saint, was sidelined with an ankle chip which required surgery. He was prepping for a return to competition when he fractured a left shoulder in a workout and had to be euthanized. If Saint Liam was Saint Ballado’s best son, there’s no doubt that his best daughter was Ashado, champion 3-year-old filly and champion older mare. Her brother, Sunriver, wasn’t that league, but did win the Peter Pan Stakes (gr. II) at 2, and the Bowling Green Handicap (gr. II) and Hollywood Turf Cup (gr. I) at 3. Although he wasn’t precocious, Sunriver now has a first crop grade I winner in the shape of Weemissfrankie, who took the Del Mar Debutante Stakes (gr. I, video below) on Sept. 3. Normally, this might be the sign for a young stallion to move from New York to Kentucky, but sadly Sunriver was found dead in his paddock in August, 2009, after covering his second crop of mares. One son of Saint Ballado who is still with us is Star Dabbler, winner of the Indiana Derby (gr. II) and runner-up to Henny Hughes (TrueNicks,SRO) in the King’s Bishop Stakes (gr. I), who stands to Northern Hemisphere time at Richland Hills, Midway, Kentucky. A brother to useful Louisiana sire Run Production (TrueNicks), Star Dabbler hasn’t yet made a huge impact with his first two U.S.-sired crops, but from a crop sired in Chile, he already has three graded winners, including Maria Morena, who captured the Clasico Polla de Potrancas (gr. I) earlier this month. Star Dabbler may never have enough opportunites to revive his line in the U.S., but the fact that he brought up a grade I triple for horses from the first crop of three Saint Ballado sons make one wonder what the potential for the line might have been had not Saint Ballado, Saint Liam, Buddy’s Saint, and Sunriver not all died so far before their time.